I've been using Instagram Stories heavily for the past year and wrote some tips from what I learned for Fast Company. Using Instagram for journalism and storytelling is an easy way to connect with a new audience and directly inform viewers from the field. Stories allows that option in an almost-live setting. These tips might help you break through the noise. Read the full articles and see some videos here here. "Fewer than 500,000 Christians are now left in Iraq, down from 1.5 million in 2003," writes Anna Lekas Miller. "Fearing religious extinction, many are advocating that the displaced return home now that ISIS has been driven out." Pickup a copy of Sojourners to read Anna's story about Iraq's dwindling Christian community and their uncertain future. A selection of my photos from the past two years runs alongside the essay. TIME asked myself and a handful of other photographers to select and write about an image from the battle for Mosul. Read and see what other photographers wrote about here. Out of the desert they walked, trudging through the sand and dust kicked up by Iraqi special forces Humvees. Some carried small bags of clothing. Others held sticks with white cloth tied to the end. Mohamed carried the tiny body of his two-month-old daughter wrapped in bloodied linen. It was Feb. 23 on the southwest outskirts of Mosul, the day before Iraqi forces began their campaign to retake the western half of the city. Their attack prompted thousands of civilians like Mohamed and his family to flee. They had been sheltering inside that morning when some sort of munition hit their house. The explosion killed his wife, their infant and an unconfirmed number of other civilians nearby. Security forces clustered Mohamed’s group together near a concrete home where his family sought out water. First they gulped desperately, then they washed the child’s body. Two women joined by the girl’s elderly uncle stripped the body in the shade behind the house. Holding the lifeless form by one leg, they poured water from plastic bottles over it. No one spoke as the artillery and explosions echoed from the distance. I watched with a young Iraqi soldier, who looked at me and shook his head in sadness. After re-wrapping the body in the linen, the girl’s uncle walked back out with a broken pickaxe and a shovel. He and other men from the family selected a small spot in the earth and began to dig. Tired and exhausted from their journey, and frail from the months of siege, they struggled to make a dent. Each took turns before collapsing beside the hole in the earth. After digging for about 45 minutes they lowered the body. The flow of civilians passed by as smoke from the fighting rose behind them. "This week, three years after Islamic State militants seized Mosul, Iraqi prime minister Haider al-Abadi entered the city to announce its liberation, declaring victory in the 9-month siege even as fighting continued in the last pockets of ISIS-controlled territory." 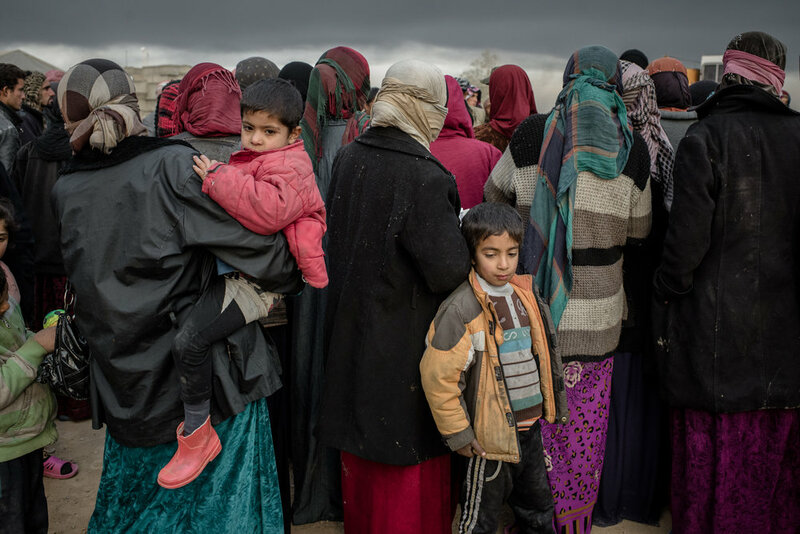 "With Mosul being declared recaptured this week, The Intercept could not have picked a better time to publish this stunning photo essay by Cengiz Yar. Yar has been covering the invasion since the beginning, and his closeness to the subject is apparent in the intimate access and broad scope of the work. The photos, some of which are difficult to look at, are a reminder of the bittersweet victories of war." "During these past few weeks, we have noticed a glut of images and media produced by photojournalists working in Mosul and the surrounding area. Even as photographers are disseminated their work through traditional means like shooting for major news outlets (BBC, Reuters, the New York Times, Al Jazeera, and beyond), they were simultaneously using their personal social media accounts to provide frequent (even hour-by-hour) updates on the battle—as well as shots that portray the heartbreaking realities of living in a city besieged." Three years after Islamic State extremists seized Mosul, their defeat is at hand. At great cost to life and property, Iraqi forces have nearly completed their eight-month campaign to recover the ancient Iraqi city. But Mosul lies in ruins and rebuilding it and returning many of its tens of thousands of residents will likely take years and cost billions of dollars. "After his nephew was shot trying to flee the old city of Mosul, Abu Taha was trapped. Under the rule of armed extremists, just to be seen with a packed rucksack was enough to get him killed. Instead, Abu Taha decided to hide in his basement with his nine children and wait for the fighting to end. Finally, last week, as Iraqi government forces battled their way into his neighbourhood, they were able to make their escape." "Iraqi forces are using small, off-the-shelf drones to target Islamic State in the crowded and twisting streets of Mosul’s Old City, where the militants are making a last stand. Iraq’s counterterrorism forces on Tuesday said they pushed to within a few hundred yards of the al-Nuri Mosque, where Abu Bakr al-Baghdadi officially announced the creation of the Islamic State caliphate in 2014, and has been a symbol of the militants’ power." "Iraqi forces have advanced to the base of the toppled minaret of Mosul’s Great Mosque of al-Nuri, hours after it was destroyed by Islamic State militants, as the bitter eight-month battle to recapture the city reached a tipping point." "The town of Ba’aj is deserted and broken. Its streets are blocked by overturned cars, its shops are shuttered and the iron gates of its ravaged homes groan in a scorching wind. Amid the wreckage, though, are the signs of new arrivals – forces who less than a week earlier chased Islamic State (Isis) from one of its most important territories in northern Iraq." Daily life in the two halves of Mosul contrast sharply. At times on the eastern bank it feels like there was never a war or that ISIS had once ruled. However in the west, destruction is everywhere and the misery overwhelming and unrelenting. I tried to sum this up in photos during two days chasing similar city scenes last month for The Wall Street Journal. Read the piece and see more photos here. Very honored to play a small hand in the creation of this massive project in collaboration between Google and UNHCR. This website offers incredible detail and information on Syria and the Syrian people. Please take some time to walk through it and share it widely. screengrab from website, image not mine. 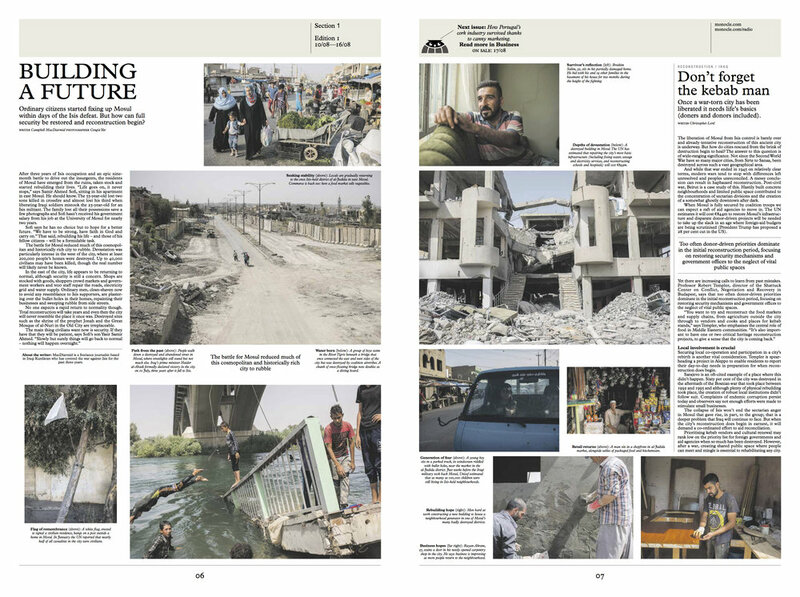 My latest from Mosul for The Telegraph alongside Campbell Macdiarmid as the push to clear the city grinds on. I was included in a TIME Lightbox piece about how photographers are using Instagram Stories. "It allows me to put the battle for Mosul in front of someone riding the bus to work in Texas or rocking their kid to bed in Indonesia. Stories allows me to put this crisis in their hands. That's powerful. As journalists struggle with ways to inform people about what's happening in the world, it seems foolish not to use it. It's clearly effective." In March I had the opportunity to partner with International Health Partners to illustrate their work and the severe medical needs in the northern region of Iraq. Find out more about their incredible work here. I've received an increasing number of questions specifically asking what's the best way to get involved and help with what's happening in Iraq and Syria. There is now a side FAQ page on this site to outline my suggestions for helping and as a space for answers to other common questions in the future. I was recently invited to NYC by Instagram to give two presentations about how I've been using their Stories platform to cover the battle for Mosul. Some of my imagery from northern Iraq is also on display at the Instagram and Facebook offices in Manhattan.